You will have to wait another two months before you can install the final Windows 8.1 update on existing Windows 8 machines or buy computer systems that ship with it pre-installed. Many users expected Microsoft to release the update in August, but that was never more than a rumor. Windows 8.1 will hit the market about a year after the official release of the Windows 8 operating system, and it will be free for existing users. The update will be available for all Windows 8 users through the Windows Store on October 17th, and as a retail version starting October 18th. While not explicitly mentioned, it is likely that the update will also be made available as a standalone download. Interested users can still download and install the Windows 8.1 Preview which provides them with some but not all of the new features that Microsoft has integrated in the update. Some of the features that are already available are Internet Explorer 11, a revamped search behavior, a redesigned Windows Store, integrated cloud connectivity with SkyDrive or more personalization options. Features that were not included in the preview are a new bunch of tutorials that help you understand how to operate Windows 8.1 new cues that help users find and use features in the operating system, or the new "motion accents" personalization feature that animates the background when you scroll on the start screen interface of the operating system. Windows-X menu now with sign-out option. New "motion accents" feature on start screen. New tutorials, including screenshots, short textual explanations, animations or links to Internet contents. Several core apps have received updates. Assigned Access is back. 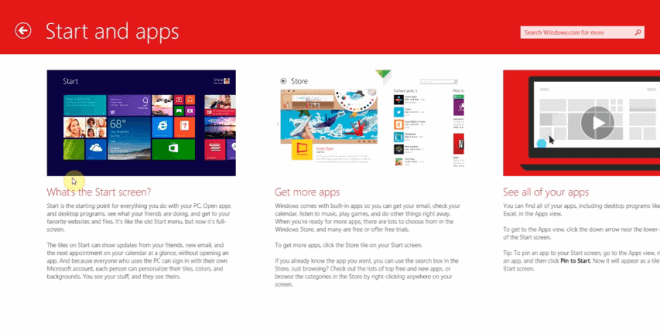 Select a (user) account to have access to only one Windows Store app. SkyDrive fully integrated in the system. You can now change the location of the SkyDrive folder on your hard drive. The most likely scenario right now is that Microsoft will finish up testing of the operating system in August, get the RTM release of Windows 8.1 out soon thereafter and distribute it to OEMs and partners so that they can start integrating it into their products. It is interesting to note that Microsoft may not make the RTM version available on MSDN or Technet soon after it is hitting RTM status. That's however just a rumor at this time and not something that got confirmed by Microsoft yet. If you want to get your hands on the update at the earliest possible - legal - moment, you may need to download and install it by visiting Windows Store. Here is a video that highlights many of the changes of the latest Windows 8.1 build. It is clear that Microsoft is addressing several of the issues that users of Windows 8 had with the operating system. Windows 8.1 attempts to provide users with additional visual cues and tutorials to understand features of the system. Can i use People app without using Microsoft/Live account? And by the way, did you consider adding Disqus comments system alongside with new theme? I’m not sure about the first question. I considered Discqus but do not like it for a number of reasons, number one being that it adds another script that needs to be loaded to the website. I won’t sign with Discqus. They have the ability to track you across websites. There are many sites that I can’t make comments on anymore because of this privacy issue. Ghostery blocks Discus by default, so they consider it a bad thing. You mention ‘revamped search behaviour’: is this through the search charm or the search box in explorer? I ask because search in explorer in win8 does strange things: besides ‘finding’ seemingly unrelated items if you do a search, which often takes a long time and successfully finds a lot of results and then doing the same search again it instantly says no items found. What seems to me to be happening is that when it does a search it compiles an index and when doing the repeat search uses the index but uses a defective index. I am unable to get anywhere with index options which sometimes hangs or crashes explorer. i wonder if anyone else has experienced such problems. What I mean by that is that Microsoft decided to move away from the Search Charm to find stuff in apps. Apps now display a search of their own, and the default Search Charm search engine is always Bing Search. many new great freatures but i still love Windows 7..
Is there a way to prevent this behavior and stay with local search only or separate both searches into 2 tools ? I’m looking forward to applying this update to my new Win8 laptop. While it doesn’t “fix” Win8, it sounds like a definite improvement. I’ll probably still run Classic Shell to restore removed functions. The one thing I’m not happy about is Skydrive being the default storage location. I wouldn’t store anything on there without encryption because it is a known fact that MS scans your files and they’ll lock your account if they don’t like something. I’ll use my own cloud. Not to mention that the NSA stores all your cloud data sent to Skydrive permanently using PRISM.